This one might seem like a given to some, but I’ve witnessed enough awkward light-jobs over the years to realize that not everyone is hip to this particular technique. The concept is simple – Toasting the foot of the cigar dries out the tobacco leaves, particularly the binder and wrapper, to prepare them to light. Toasting the foot will ensure that your cigar will light up evenly. To do this, hold your cigar at a 45-degree angle over the flame, about three to four inches from the tip of the cigar and rotate the cigar until the foot begins to ignite. Never letting the flame touch the cigar, slowly puff on the cigar while rotating it around the flame. Once the surface of the foot is blackened and begins to smolder, take a couple good puffs a bit closer to the flame and you’ll be off and smoking straight. One of the neater tricks I’ve come across, cutting a cigar with the cellophane still on it (cutting through the cellophane as well as the cigar) provides a cleaner cut, helps keep your cutter blades sharp longer, and is good etiquette when borrowing someone else’s cutter. Of course, this one only applies when cutting a cigar that comes in a cello, but once you see how well this works, you’ll likely do it whenever you get the chance. Not only can ripping the band off before lighting up tear the wrapper of your cigar (as we discussed here), it also strips away the aesthetics, and a bit of the “personality” of the cigar you’re smoking. To prevent damaging the stick, it’s better to leave it on, at least until the cigar warms to the point where the band will come off easily without compromising the cigar. Also, when smoking at as lounge or in company, the band of your cigar is a great conversation starter. (ex: “Oh, I love that stick!” or “That brand uses too much glue on the bands.”) That being said, if you’re smoking nudes (cigars with no bands on them, like these), you’re excused from this pointer. The ash that builds as you burn acts as an insulator for the foot of the cigar and keeps the cigar smoldering evenly. It also helps to ensure the cigar does not burn too hot, which in turn reduces bitterness. You don’t have to go for any world records, but if possible, try to keep an inch or so of ash in place at the foot as you smoke to keep things burning nice and smooth. Also, rocking a big fat ash tends to look pretty cool, and is a testament to the quality of the cigar you’re enjoying. The drink accompaniment you pair with your cigar can make or break your smoking experience. Many a seasoned smoker will extol the virtues of a good cup of coffee when paired with a fine smoke, others swear by a nip of whiskey, and there are those adventurous types who will recommend things like Dr. Pepper soda, or even chocolate milk. The bottom line is that cigars tend to dry the mouth while smoking, so a beverage will keep your taste-buds well-oiled in order to soak up all of those delicious tasting notes properly. Picking a drink that compliments the flavor of your cigar only enhances your smoke. If you’re more of a purist, a plain ol’ glass of water will allow you to taste your cigar’s natural flavor unfettered by any other elements, which in many cases is your best bet. What’s that? 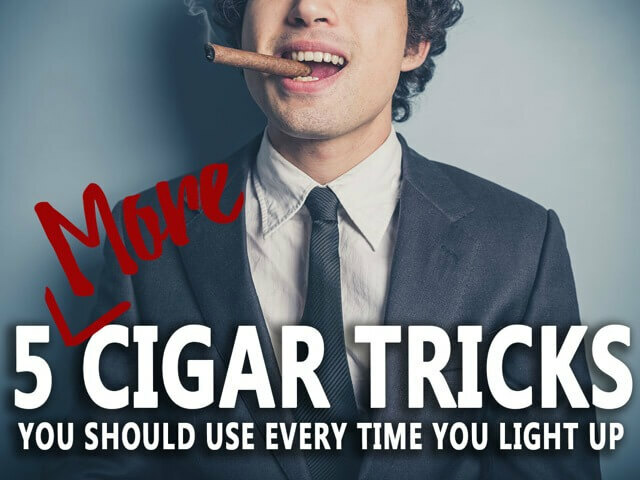 You’ve got some cigar tricks of your own you’d like to share? Enlighten us on Facebook or Twitter and maybe we’ll include your suggestions in a future article.